I’m 56 years old with large pores, combination skin, and hereditary rosacea. So I am very particular and fussy when it comes to skin care, using no potentially-irritating products or cleansers on my face. I’m also a shift worker, so the times I apply my products are not on a regular schedule. Never the less, I work very hard to keep my skin bright and soft without any blemishes or redness. 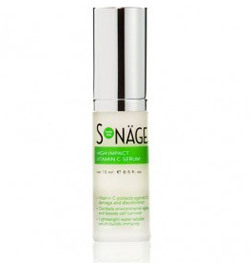 After cleansing my face, I applied the Sonage High-Impact Vitamin C Serum ($32 in the shop) about half and half with my regular prescription for rosacea. The smell of the serum caught me off guard — it smelt too citrusy and I’d hope for a more luxurious fragrance. I didn’t notice any difference in tightness or wrinkle control. It did, however, mix well with my rosacea medicine and left my skin soft and radiant. I will definitely continue to use the serum, but just wished it smelled differently.